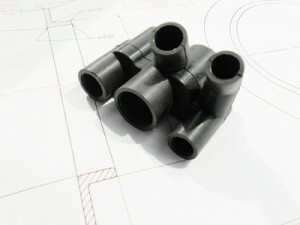 General Rubber Mouldings prototyping and manufacturing form the bulk of work carried out at Techmould. Industries served and the Application, Materials, Colours and Sizes are too wide to list individually. Mouldings from less than a gram to 2 Kilograms, single or multi-cavity production, prototype development to full production quantities. Using your own moulds or manufacturing new ones in our on-site tool room. 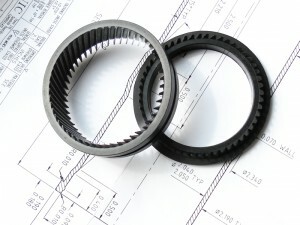 Rubber mouldings are perhaps our largest grouping of products. If size, shape or tolerances prevent the use of rubber sheet materials, rubber mouldings and rubber extrusions may be the solution. Techmould’s rubber moulding and manufacturing services cover a wide spectrum of colours and hardnesses including natural rubber, neoprene, hypalon, nitrile, silicone rubber and viton. Visit our rubber materials page for more information. Techmould supply general and bespoke rubber moulded components to industries including the aerospace industry, automotive, defence, electronics and food production. Call us at the design stage and we will be able to help you deliver greater benefits in terms of cost, design effectiveness and ease of production. Full range available , specially compounded and coloured if required to meet the specific application. FDA compliant and WRC approved grades available.